Jen Mesch Dance Conspiracy, featuring members of Good Women Dance Collective, went to extremes to film dance in a cave. See a Cavern video here! If you’d like to help build and support Cavern, please consider a donation! We still have perks from our fundraiser that we will be happy to honour. $25 – Free music download from Cavern and a squeeze! $50 – Free video download of scenes from Cavern, free music download, and a squeeze! $50 – special deal! 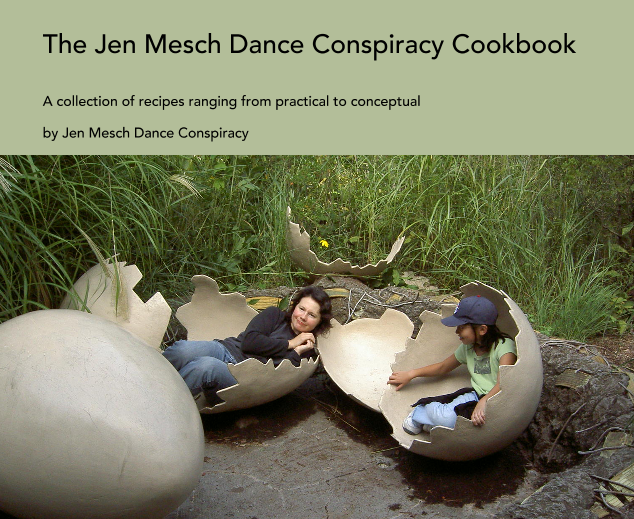 A truly unique Jen Mesch Dance Conspiracy Cookbook, in full colour with recipe contributions from past and present collaborators. And a squeeze! $75 – Cookbook, music and video, and yes, a squeeze! You can check out our previous fundraiser, including a making-of video and a list of the perks for donating.